So, you’ve simply fallen in love with the guitar and in your nearest plans is to definitely become at least a backyard star if not a rock star. You’ve watched loads of YouTube videos, you’re practicing hard: scales, licks, exercises, chords but you evidently feel lack of something. Those guys on the stage pull crazy stunts with the guitar, but your playing is more like mockery of yourself. Maybe, is there anything wrong with you? In general, there is, but nothing you wouldn’t be able to correct. The problem is in quite simple mistakes that practically each beginner makes. So do you. These silly mistakes literally paralyze hands and interfere with playing. This is no music matter. 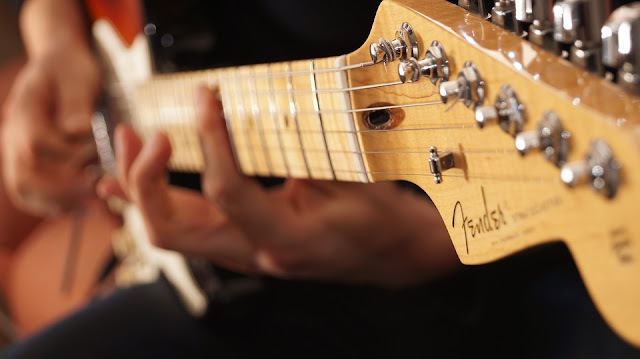 Let’s start with the simplest – check if you’re holding your guitar right. Yes, quite so! If during playing you literally press the guitar body with your right elbow toward you, grip at the neck until your finger-tips turn white you hope to God not to let the guitar capsize – forget about the pleasure from playing the instrument; music will turn into back-breaking labor for you. Let’s specify, now we don’t consider playing in a standing position when the guitar is hanging on the strap, about it a bit later. So, the guitar – it doesn’t matter if it’s acoustic or electric – is initially designed and balanced so that you can keep a comfortable position without much effort. Try the following: Sit back, hold your back upright, put the guitar with the cutaway of its body on your left hip (remember to pull it closely toward you so that your body can also serve as a support) and give the neck a tilt at about 40–45 degrees. In this position, the guitar has already been keeping balance quite well and isn’t going to fall anywhere. As soon as you have have pressed down a chord with your left hand, all done! The instrument has been firmly set whereas your right hand is free from the necessity to additionally press down the guitar and can move free. By the way, this moment is also very important as the guitarist’s right hand constantly has to jerk up and down a good many times, and its rigidity is another problem. Now let’s talk about playing on a strap. Another inexcusable error will be to blindly copy that what looks so cool in video clips when hairy guys play the guitars that hang too low on the straps. Nobody argues it looks quite cool, but actually it is suited only for very primitive technique (playing simple riffs with 5th and 4th chords) and, of course, for clip shoots. When the position of an instrument is so low, the wrist is almost completely deprived of freedom, and you should forget about masterly passages. Do you need any evidence? Here you are – turn on any live gig of Steve Vai, Joe Satriani or any adept guitarists… These guys feel in no mood for showing off, and their guitars hang at least at the stomach level, and many guitarists pull them even a bit higher. It doesn’t look so daringly, but it’s very comfortable to play the most complicated passages for which people come to gigs. The next both literally and figuratively painful issue is the overpressure of the left hand when it presses a chord. For one second, take your mind off the thought about such a “heavy work” as playing and look into the instrument. It turns out that the strings on a well-tuned guitar are quite low above frets and soft enough to get pressed down without any super efforts. The conclusion: it doesn’t make sense to grip at the neck like a drowning man grabs a lifeline. Try to press down any simple chord and to relax the hand at most. This is exactly the right technique. There’re two tricks with the guitar pick: you need to hold it correctly and to pluck strings in a specified way. If you don’t fulfill these two conditions simultaneously, the pick keeps slipping out of your fingers. Consequently, you have the only idea in your head: “Anything but not let it drop!” Now try to memorize the right guitar pick grip: put it on your index finger (the pick’s axle coincides with your finger’s axle) so that it itself can keep balance, then cover it with the broadest side of your thumb. Due to natural skin humidity, the pick will “stick”, and it’ll become a lot easier to hold it. The pick will maintain high mobility as well. There’s the only trick with the pluck – make sure to get the pick laid on the string flat wise (parallel to it) while plucking it. It’ll stop dropping out of your hand at once. Finally, there is another inexcusable error that will definitely prevent you from developing. It’s disregard of the work with the metronome. I really often happen to hear complaints from beginners that the metronome distracts and even disturbs them. There are memes on this subject going around in networks. In fact, if you’re not used to it, playing to the metronome (or the drum machine) can cause a multitude of inconveniences. It seems to be logical to save you torment and necessity to constantly adapt yourself to machine rhythm. The recklessness of this decision will be evident as soon as you try to play a more or less rhythmically complicated passage with your friends or to a backing track. Rhythm is the most important aspect of music as well, and in consequence of inexperience, the beginner always tends to brake slightly in difficult parts or, on the contrary, accelerate the process in more comfortable parts. From the outside it sounds like a lowly cohesive and unintelligible melody. The metronome doesn’t allow such liberties and lay you under obligation to clearly put the melody in rhythmical frames. In course of time applauding fans or at least your delighted friends will be the reward for the efforts you made. Elijah Kuttikhen is a professional Audio Engineer, studio owner, guitar tutor. He is the founder and owner of EKmixmaster studio providing mixing and mastering services for artists and labels around the world.